Soy, you think it’s healthy? Tofu, soy milk, soy cheese? Think again. This so-called healthy-alternative to dairy products and other protein-rich foods, is a misnomer with a long history of contradictory research. Did you know that soy, if not processed properly, is toxic for human consumption? Also, the digestive system really doesn’t know what to do with this legume. So, where does it go? 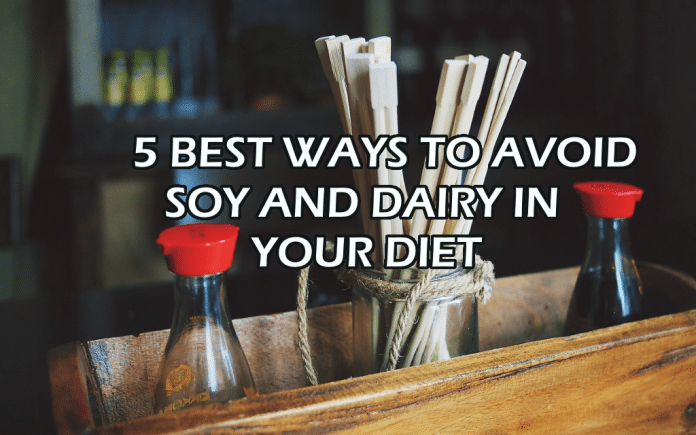 More alarmingly, soy is one of the top foods classified to incite allergic reactions; it’s almost as fatal as peanuts in the allergy department. Soy is proven to prevent some cancers; however, it is also proven to promote cancer, especially breast cancer in women and prostrate cancer in men. And what about dairy? It’s in just about every packaged food product on the market, just like soy. It’s just as difficult for the human body to digest as soy. And, what’s really scary is that both soy and dairy are among the top ten allergens in North America – right up there with the ever-so-well-known allergen, nuts! So, what can you do? Aren’t you just a little worried now that I’ve mentioned it? I know I am. And, what’s even scarier is that both soy and dairy products are so altered, genetically and through production, that they are no longer pure when used in the food industry. In a large glass measuring cup, dissolve honey and yeast in the 1 ¼ cup warm water. Add olive oil. In a large bowl, measure 4 cups of the all purpose flour. Add sea salt, eggs and yeast mixture. Stir until too stiff to stir and then knead, adding additional flour until the mixture no longer sticks to the hands. Turn onto a floured surface and knead until a smooth firm dough forms, continuing to add flour if needed to keep it from sticking. Cover and let rise for 10 minutes. Punch down dough and shape into 8 balls, piercing a hole through the centre with your thumb. Stretch and shape into an even ring. Place on a floured surface, cover and let rise another 10 minutes. Meanwhile, bring 3 cups water and 3 tbsp honey to a boil in a large cooking pot. As soon as the bagels have finished rising the final 10 minutes, drop them into the boiling water, one at a time. Cook for 45 seconds, turn and coork for another 45 seconds. Remove bagels with a slotted spoon and drain on a clean dishcloth while you cook the other bagels. Once all the bagels are cooked, removed from the dishcloth to a baking tray lined with parchment paper. 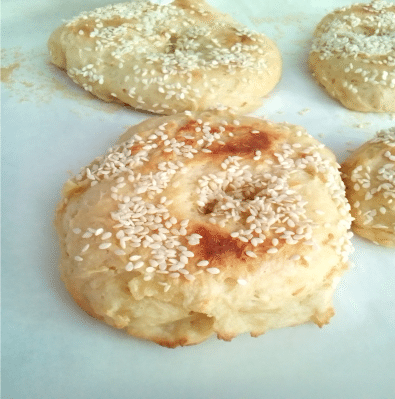 Cover bagels with sesame seeds, minced onion or poppy seeds, if desired, or leave plain. Bake in a preheated 375°F oven for 20 minutes. Remove to stove top and careful turn bagels over. Return to oven and bake for another 20 minutes, or until golden browned. Serve warm or cold. Freezes well. Makes 8 bagels.